Here are the links from our Rom Family Chiropractic Facebook page and all the good stuff we posted last week! Does your low back “go out” more often than you do lately? Does it take extra effort to get out of bed in the morning? Are you doing less of the things you enjoy with the ones you love because of back pain? If you said “Yes!” to any or all of these questions – YOU have a low back issue. If you or a loved one has been struggling with a lower back issue like stiffness, pain, loss of mobility – or even sciatica – it’s time to let us help you correct the cause of that problem—without drugs or surgery! 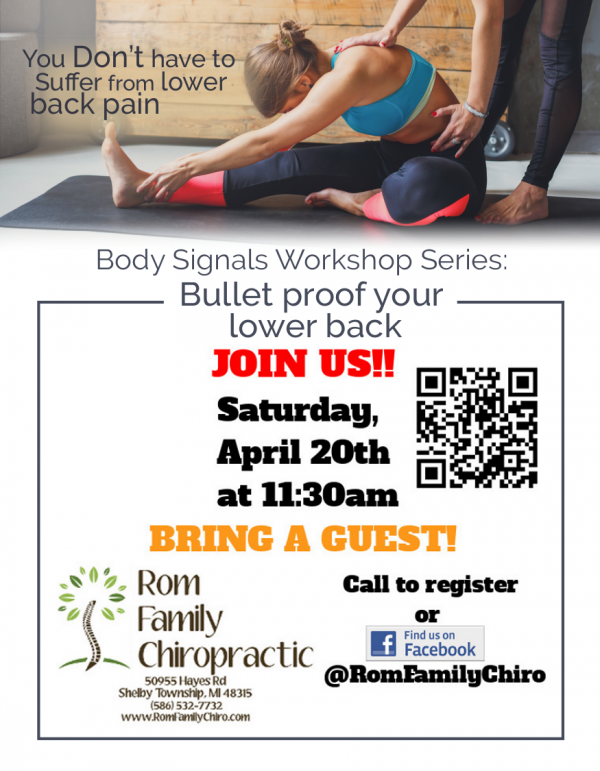 You absolutely must attend this Saturday’s workshop: Bulletproof Your Lower Back! Have You Heard That “Sitting Is The New Smoking”? Watch this video to learn more about what sitting does to the spine, and learn about how Chiropractic can help! For more information, be sure to check out our upcoming workshop: Bulletproof Your Lower Back. Another research paper that confirms the importance of what Chiropractic care allows: proper connection between brain <=> body for healing. CHIROPRACTIC ADJUSTMENTS INCREASE PROPRIOCEPTIVE FEEDBACK BETWEEN THE BRAIN AND THE BODY, EVERY TIME. PROPRIOCEPTIVE INPUT IS REQUIRED FOR PROPER HEALING. Be sure to check out our upcoming Wellness Workshop: Bulletproof Your Lower Back! If you haven’t already, check out our Rom Family Chiropractic Facebook page, be sure to like it, and we will be sure to keep the good info coming your way!